New look #NYR lines: Nash-Stepan-Zuccarello, Kreider-Brassard-Fast; Miller-Hayes-Lindberg, Stoll-Moore-Glass/Stalberg. The first notable change is flipping Rick Nash and Chris Kreider to different centers. Both are off to poor starts. Nash and Mats Zuccarello are now penciled in with Derek Stepan, who has been sharper than Derick Brassard. So, Stepan centers the top line. Brassard is between Kreider and Jesper Fast. The same Fast who was a healthy scratch twice for Tanner Glass. Odd. “When we used him in a bigger role last year, he was very effective. I’m hoping he’ll be able to compliment Brass and Kreids,” Vigneault told Sean Hartnett on the explanation for trying Fast on the second line. 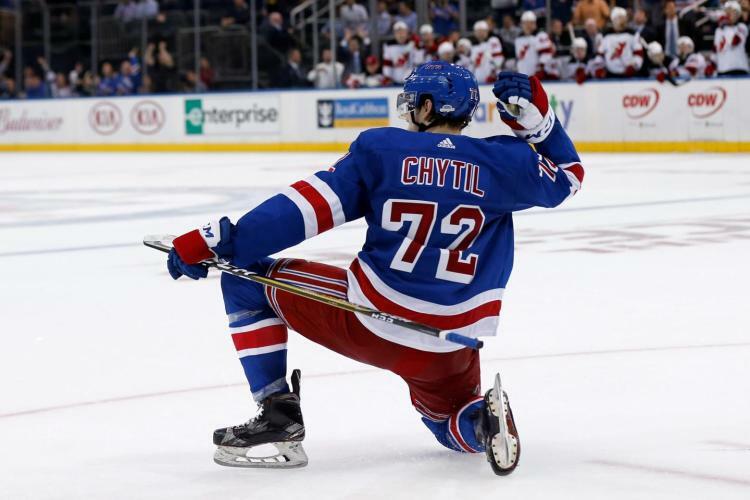 He had success in the playoffs with Stepan and Kreider as a complement forcing the turnover that led to Stepan setting up Ryan McDonagh’s overtime winner in Game 5 of the second round against the Capitals. Also switched is slumping forward Kevin Hayes. If not for a horrible goal allowed by Sergei Bobrovsky, he’d also have no goals. Hayes has been moved back to center the third line with J.T. Miller and Oscar Lindberg. All three can take face-offs. Each also has speed and are good on the forecheck. So, it should be interesting to watch. Vigneault demoted Viktor Stalberg to the fourth line. He has been good so far. He’ll play with Dominic Moore and Jarret Stoll, who returns to the lineup for Emerson Etem. So, Etem got one game. Not enough in my opinion. He and Glass are the extras. While the forward lines are all changed, Vigneault took my advice on the defense pairs. With McDonagh and Girardi struggling, he broke them up. McDonagh will play with Kevin Klein while Girardi will work with Keith Yandle. A welcome change that puts him away from top assignments and should get him more offensive zone time. Marc Staal and Dan Boyle are now the third pair. At this point, that’s where they should be. Vigneault: "Right now, Dan and Ryan who have been very consistent are having a tough time. Sometimes you split them up, see what comes up." We’ll see how long Vigneault sticks with his new lineup. In a bit of a head scratcher, he also decided to start Henrik Lundqvist a sixth straight time against the Devils for Sunday’s equally perplexing 1 PM matinee. I don’t get it. Is he that desperate for points already? The Rangers play a back-to-back with the Sharks visiting Monday. Why have Lundqvist go against the weaker opponent? It seems like a desperate move. Granted. He’s easily been their best player and is the only reason they are 3-2-0. Lundqvist has stood on his head so far with his team forgetting to play any D. He’s been brilliant. But he’s 33 and shouldn’t have to work this hard early. If you can’t start your backup against the lowly Devils, what’s the point? Antti Raanta is now gonna debut against San Jose. A much better team that’s off to a great start. The Sharks are without Logan Couture who is out four to six weeks with a fractured right fibula. But they’re still formidable under new coach Pete DeBoer with new starting goalie Martin Jones playing extremely well. We’ll see how all of AV’s moves pan out. This entry was posted in NYRangers and tagged Alain Vigneault, Chris Kreider, Dan Girardi, Jesper Fast, Rangers, Rick Nash, Ryan McDonagh. Bookmark the permalink.